The ANIC-40Kq is an advanced PCIe Gen 3, 40GE flow processor featuring a single QSFP+ Interface which support operations as a single 40GigE or 4 X 10GigE adapter designed for lossless packet capture and state of the art flow classification functions. Ideal for mission critical Network Monitoring and Security applications requiring host CPU offload, the ANIC-40Kq is based on Accolade’s next generation Advanced Packet Processor implemented in an FPGA. 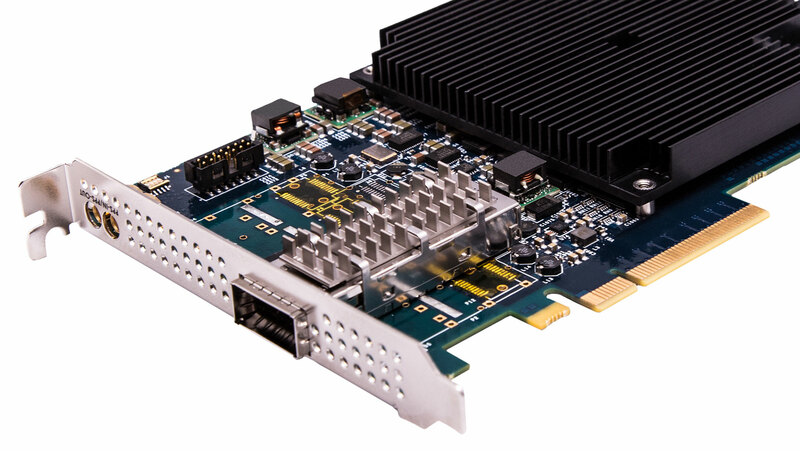 The ANIC-40Kq is designed for full lossless packet capture and transfer at 40 Gbps across the PCIe bus and supported by an 8 GB high performance DDR4 Memory sub-system. Advanced host CPU offload functions include Flow Classification, Traffic Management and Packet De-duplication. The ANIC-40Kq’s DMA Memory sub-system is designed for efficient burst transfers of data across the 8 lane Gen 3 PCI Express Bus. The ANIC-40Kq presents data in a programmable organization of Buffer Rings which enable load balancing and optimized use of Multi-Core CPU Resources. The timing sub-system in the ANIC-40Kq features an optional Temperature Controlled Crystal Oscillator (TCXO) as a stable high precision clock source. The ANIC-40Kq features a flexible timing sub-system which may be disciplined to NTP, IEEE-1588 and 1 PPS input from external GPS, GSM and CDMA timing sources. The ANIC-40Kq is available with a software development guide, Linux Drivers, sample code, and a comprehensive API that supports access to Hardware Health (PHY Status, Onboard Temperature, Voltages).